Although I have been running for over three years, the first time I ran on a beach was this time last month. I kid you not! Granted, that probably isn’t terribly shocking given I live in a land-locked state surrounded by vast plains and towering mountains, but still. It’s always been a dream of mine to run like a majestic horse across the coastline, the sea breeze a refreshing reminder of my seashore surroundings. Or I imagine it’s like the final scene from “Chariots of Fire” and that epic run along the beach towards certain victory. Just maybe I would look like the babes of “Baywatch,” albeit minus the flowing hair, sense of urgency, and incredibly tanned and toned body. I am pretty certain everything looks better in slow motion. And the perfect camera angle. But I digress. Here’s what I do know, running on sand is challenging given the friction and lack of stability when you push-off. It’s also supposed to be a really good work out. The looser the sand, the harder the workout. According to a study conducted in 1998 by three Belgian scientists, “running on sand requires only 1.15 times more mechanical work than does running on a hard surface at the same speed,” and “running on sand requires 1.6 times more energy expenditure than does running on a hard surface” (Source). My takeaway? Running on sand is super good for you! 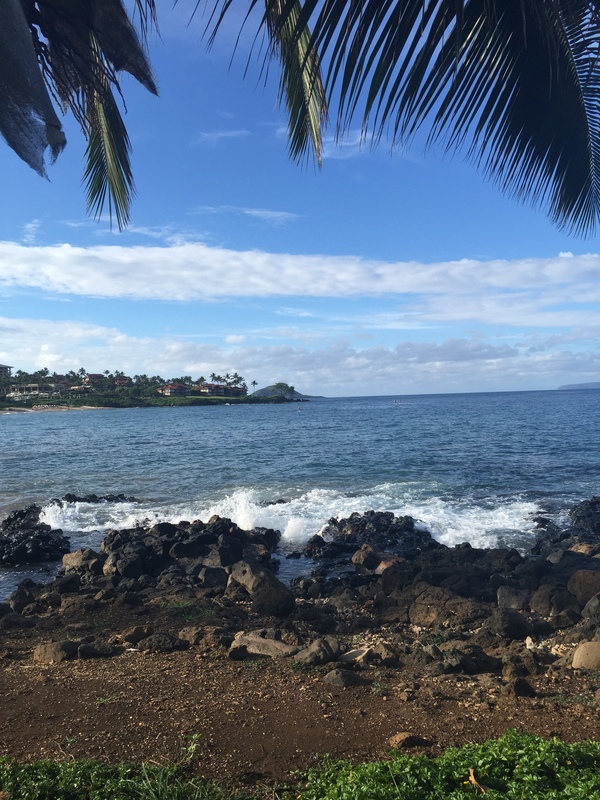 The amazing view from the coastal trail, the Wailea Beach path, that stretched from Wailea’s Andaz Resort to the Polo Beach Club. I would run between a 5K and 4 miles each morning. 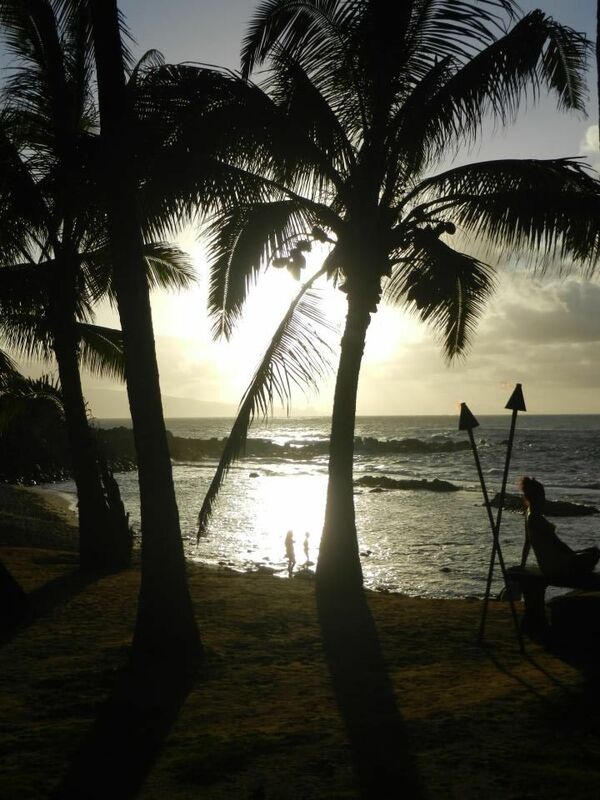 mornings running along the sand, basking in a gorgeous Maui sunrise over Haleakala, enjoying the feel of the whispering wind blowing through the palm trees, and gazing at early morning paddle boarders and surfers as I wander happily past. 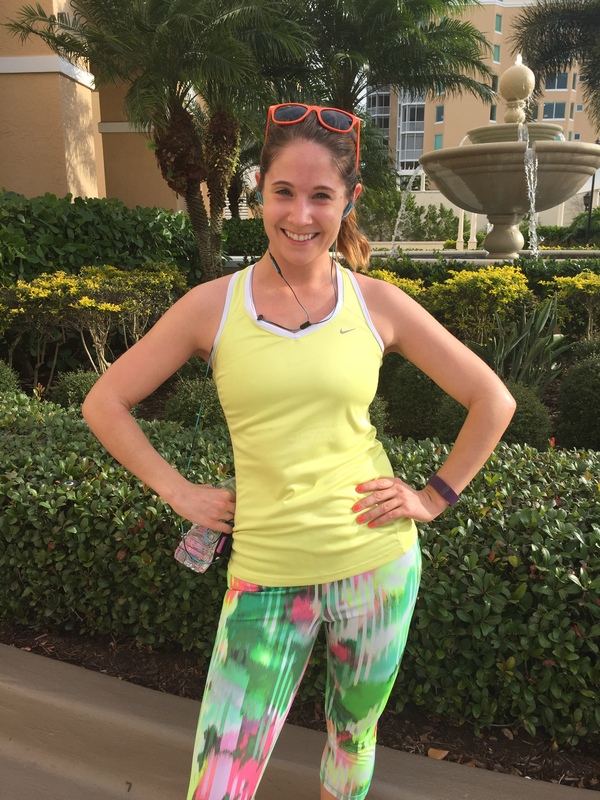 The hubs and I have been really great about enjoying opportunities to workout on vacations, and love taking advantage of running in new places. 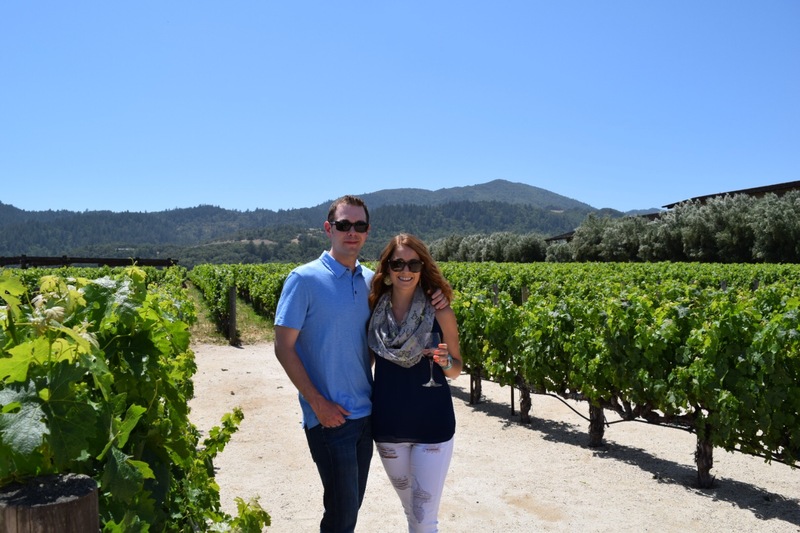 It was one of my favorite parts about our “routine” we built during our trips to London and Napa Valley, and it’s a great way to see a place as a local might. 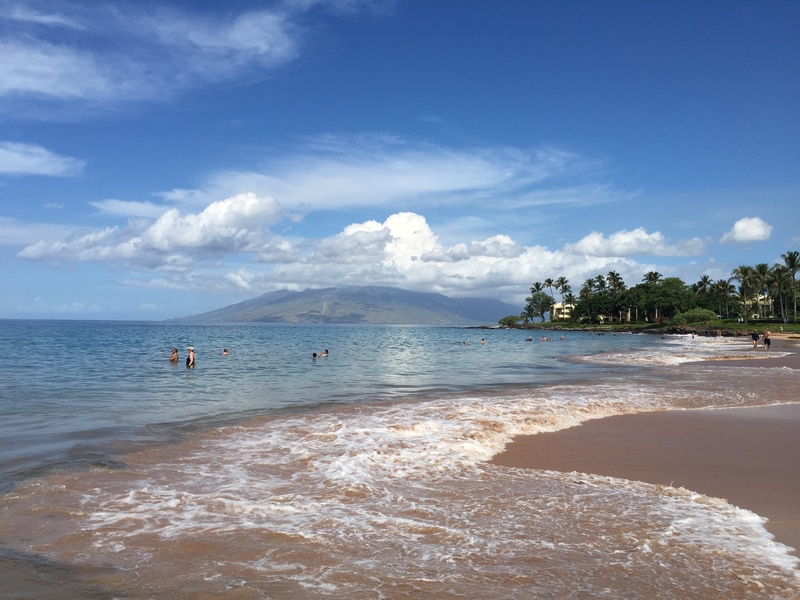 The problem with the beaches in Maui, however, is that they aren’t consecutive. Although incredibly beautiful, you can’t run for very long. So that dream was somewhat dashed. 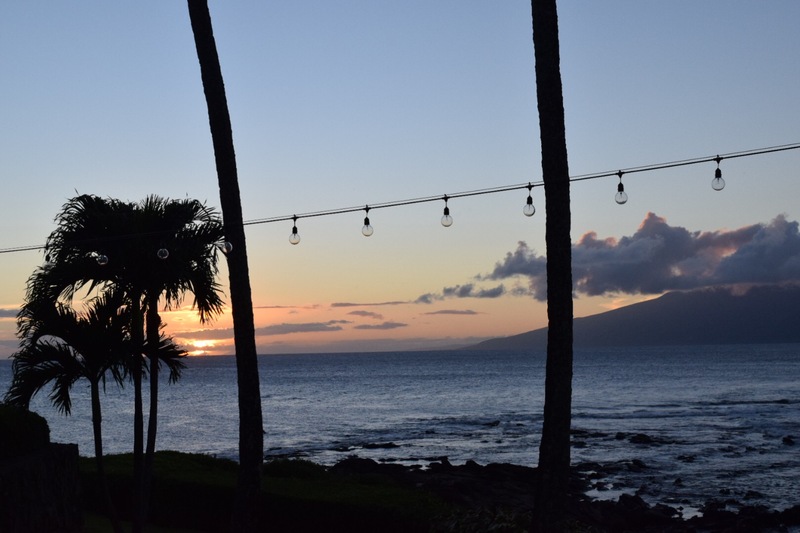 Instead, our resort offered sunrise beach yoga and boasted the perfect paved coastal path, the Wailea Beach path, which was supremely stunning and perfect for our morning run. Sunrise yoga at its finest… it doesn’t get much better than this. This, however, is the expanse of Wailea beach. Feeling great after a 13.1 PR! Yay, oxygen and sea level! 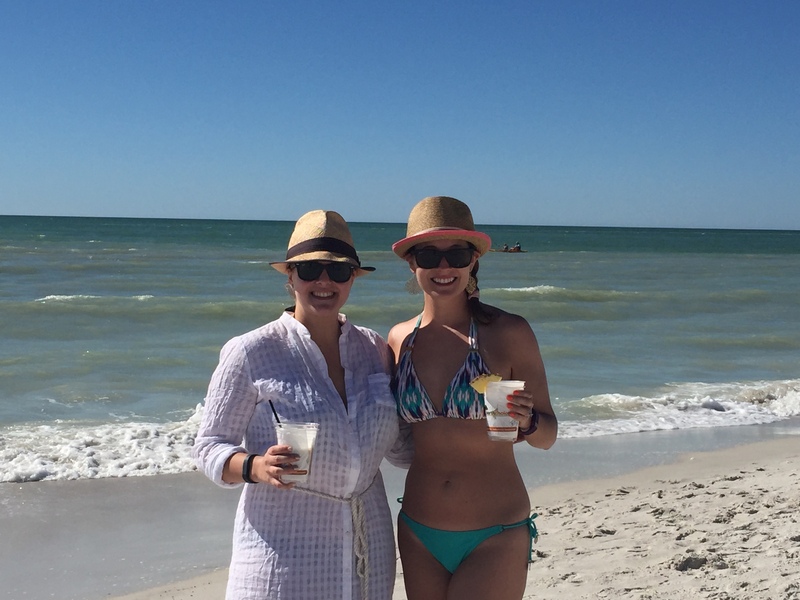 Key lime coladas, besties, and a beach. Too good to be true! 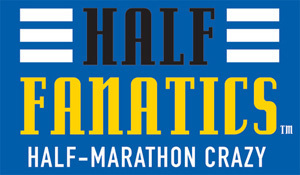 run our intended race, we planned to fit in our own half marathon instead. On the Tuesday morning during our trip, we ventured out along Vanderbilt Drive, and logged a wonderful (and PR-worthy) 13.1. 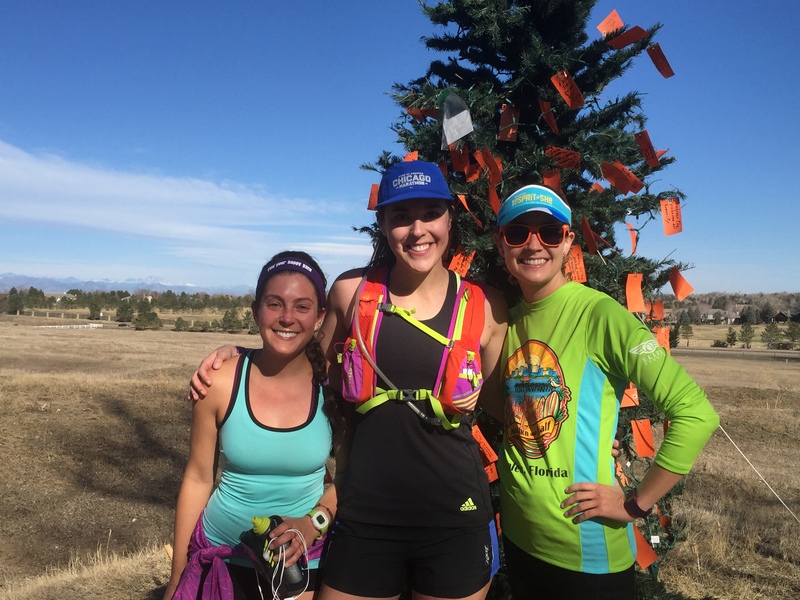 Running at sea level after serious training has definitely paid off – we ran it in 2:07 and felt wonderful the whole way! 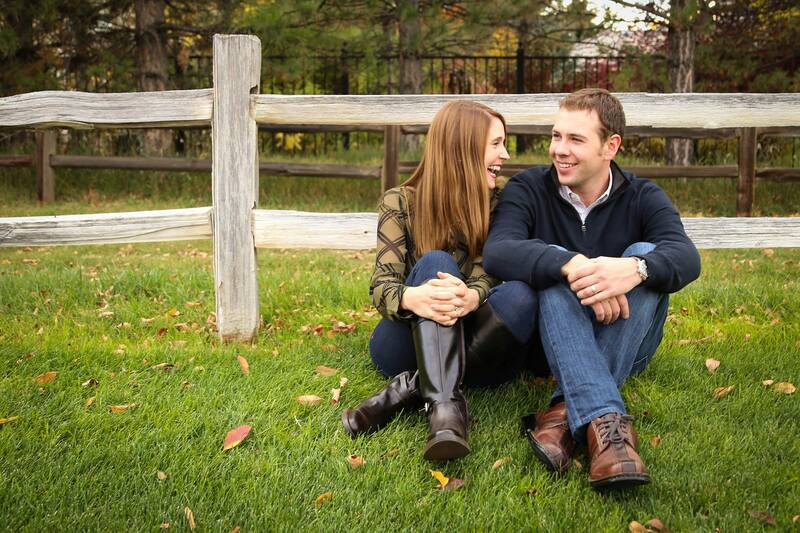 Later that day, one of my besties and fellow blogger, Ms. BakeNBurn and her hubby came to visit for a few days. They happened to be vacationing just a few hours away in Delray, so it was too good an opportunity to pass up! I could get SO used to this. running. 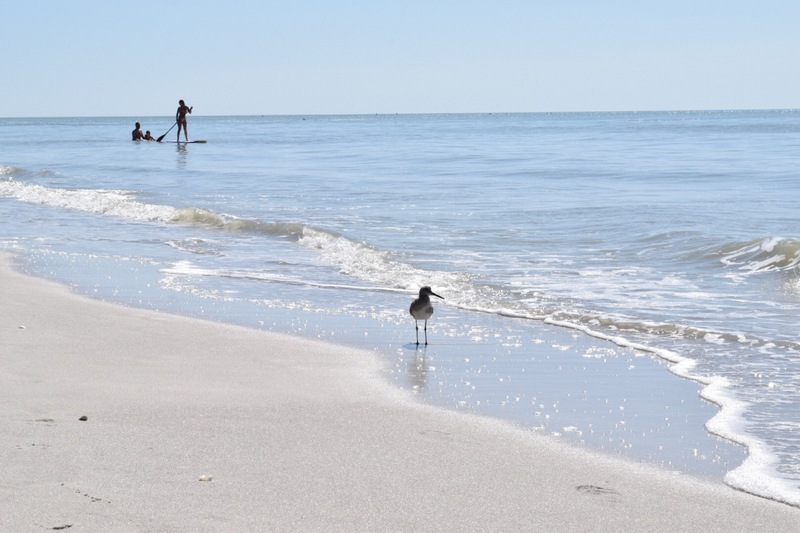 Vanderbilt beach is located in north Naples, and is a gorgeous expanse of sand and sea (well, technically it’s the Gulf of Mexico). We were able to run about 4 miles: 1 mile to the beach, 2 miles along the beach, and one mile back. After we returned, I was hooked. Needless to say we repeated this run on Friday and Saturday morning. Running on the sand was great on the joints, but gives you a slightly better workout at the same time. And better still, no music needed – the waves were our soundtrack. Find the right beach: As I mentioned, not all beaches are created equal. Wailea was nearly perfect, just not for beach running. The more space you have to work with, the better. 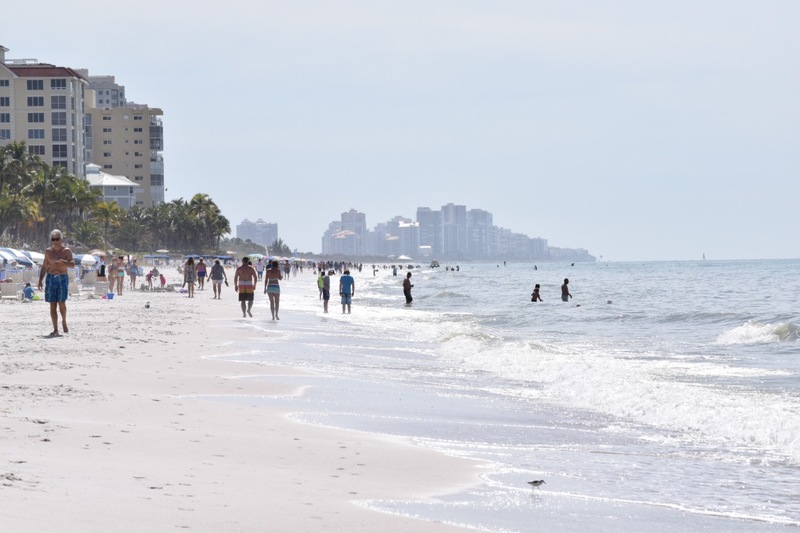 Also, take into consideration whether its likely to be a more crowded beach (public access) or not, and the time of day you want to run matters. Earlier is usually better. The type of sand is also important: Softer sand is harder to run in as there is less friction and resistance. Firmer sand can be easier but less of a challenge. Find your happy medium, or maybe start on the firmer stuff and see how far from the surf you can handle. low tide so you have more of the firm sand to work with. To shoe or not to shoe? 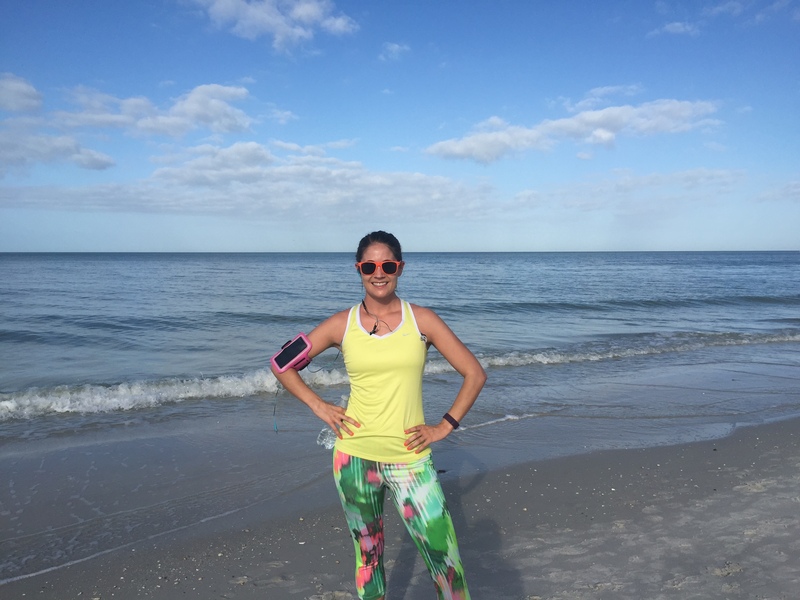 I am definitely someone who likes a little more support when I run, but keep in mind beach running can lend itself to either, especially if the sand is softer. The choice is yours! Sun, water and sand – heaven for the soul, tough on the skin. of your body: It can be quite a shock to the body to go from pavement to sand. If you trail run, or run on groomed trails, it may not be too hugely different, but ease into it and try not to push too hard the first time out. Sun protection is vital: the ocean reflects the sun rays and beaches are usually light on trees, so make sure you wear sunscreen, a hat, sunglasses, etc. to protect your skin and eyes! The last recommendation is my favorite: skip the music. As I mentioned, the ocean or tide makes for a sensational natural soundtrack. Give yourself a chance to listen and enjoy! As an aside, here’s how last week stacked up for training – we made it to 17 miles!! 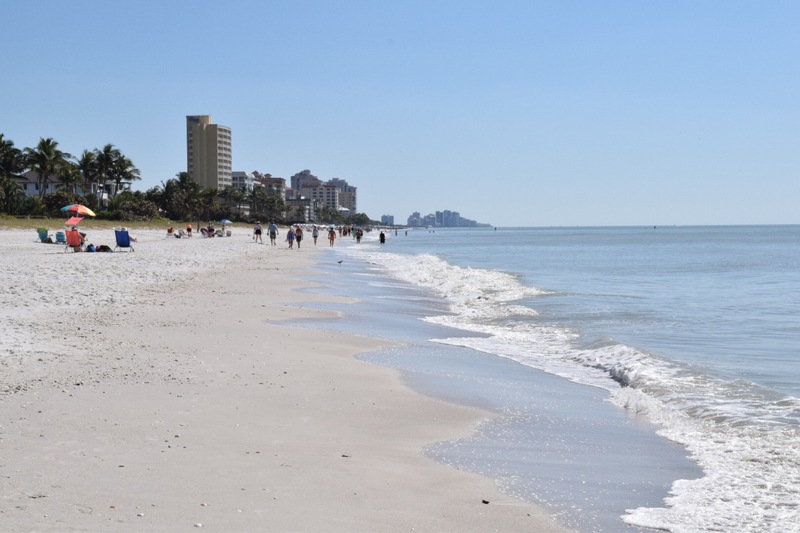 Have you ever run along a beach? What are your beach run recommendations? What is your favorite running surface? Anyone else always wanted a Baywatch moment? 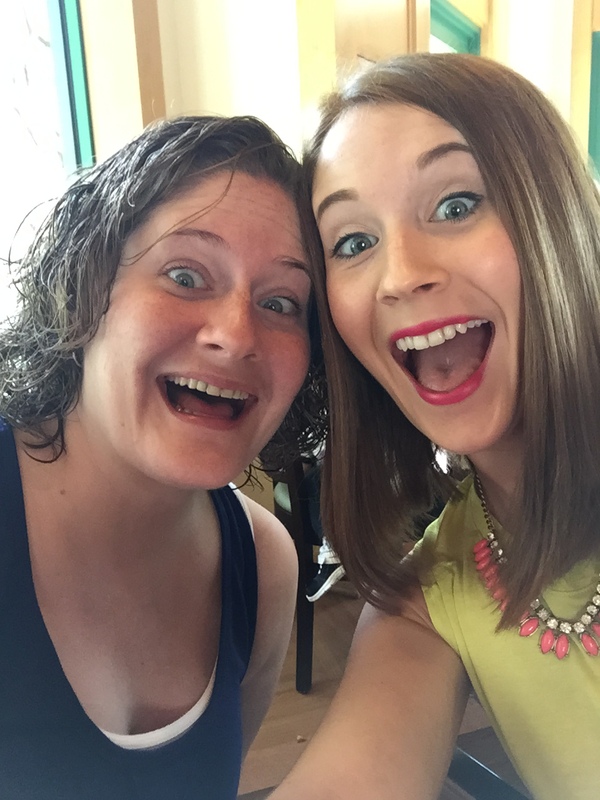 Well that was a nice little reprieve from the blogosphere – but now I am back! The month of March was an insanely busy one, and while I am glad it passed quickly, I am having a hard time keeping up. This past October I was promoted within my office, but during the transition of the past six months, I have continued to do both my old and new jobs. This has made balancing work and life rather more challenging when your work practically doubles. Thankfully this week should mark the end of the search process for a candidate to fill my former position *finger crossed* at which point I will be able to gladly pass this torch of mine. With that in mind, it’s relieved some of the stress of the piling work, but only marginally. It’s not real until the newest employee of our office signs the paperwork and shows up! 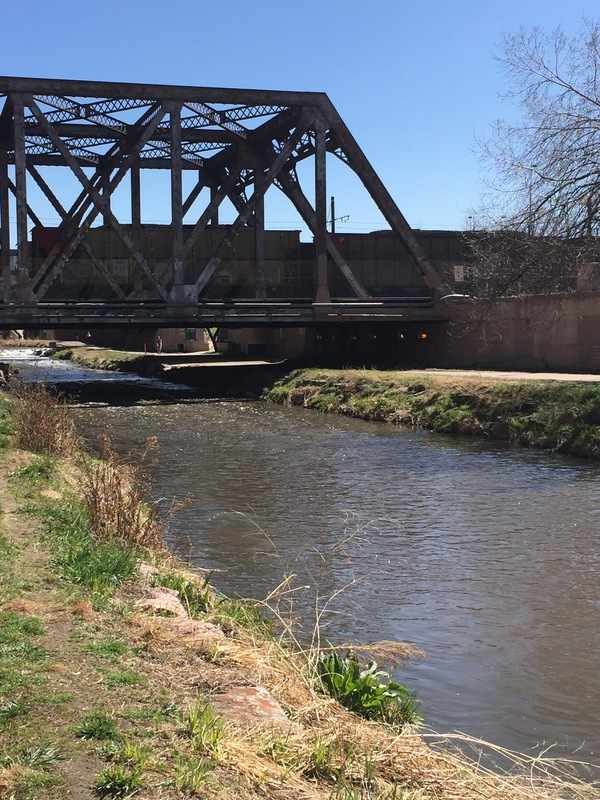 It’s been seriously gorgeous the end of March… when is the snow going to come in? So beyond the incredible work load of the past months, March was incredibly fun and full of great memories. The month started with my first half marathon of the season in chilling temperatures and snow covered trails, and is ending with beautiful, sunny 70 degree days! Of course, living in Colorado, you know there could still easily be snow through May, but for the most part, the weather has made a delightful 180 turnaround for the awesome. March is the month of Spring Break, and although I work at a university, the employees do not actually have off for the week. 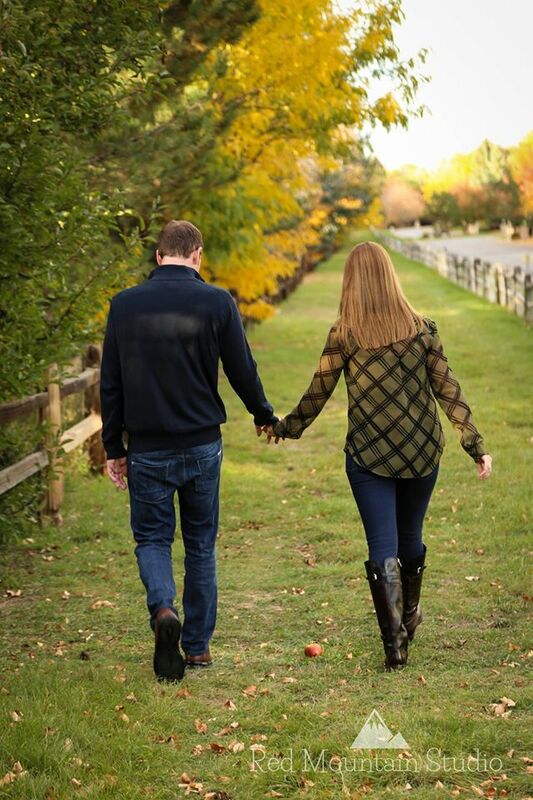 My sister and sister-in-law work at the University of Maryland (GO TERPS! 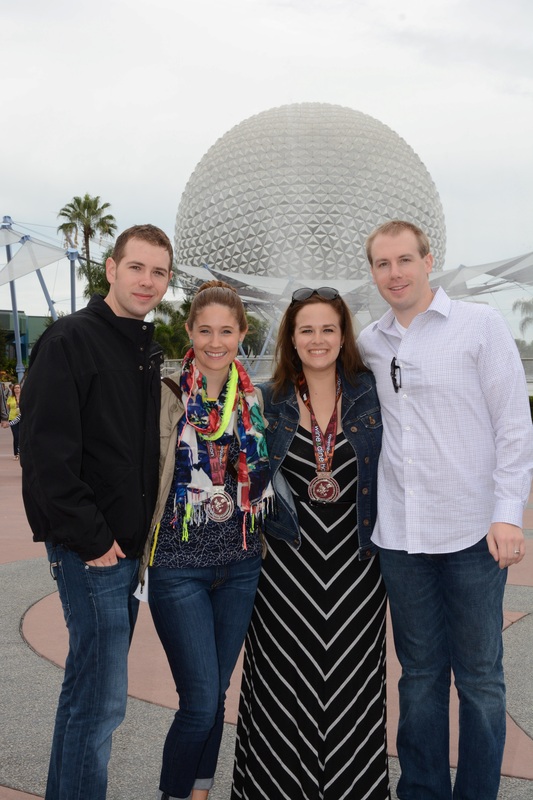 ), and they both had a week off to enjoy the springtime, so my family decided to plan a trip to Disney World. Needless to say, it is one of my favorite places to escape to, so I was on board all the way. The hubs sat this one out, and I couldn’t stay the whole week with my family, but I did get to spend four amazing days in sunny, hot Orlando (yeah, it’s cheesy but I love it). 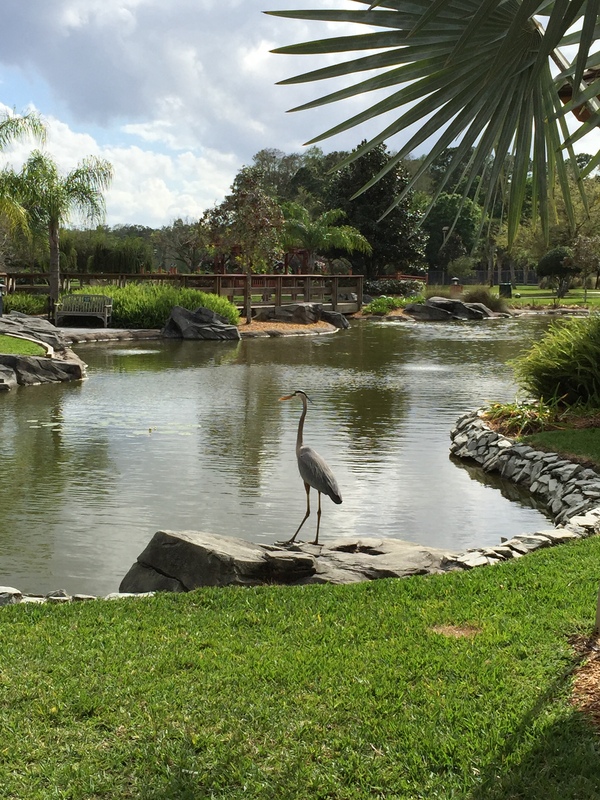 The grounds are awesome, with golf courses all around. so it was a fun time. I left for Orlando on Friday, March 13th (I know, I was brave enough to fly on Friday the 13th! EEK! ), and met up with my parents and sister at the airport. 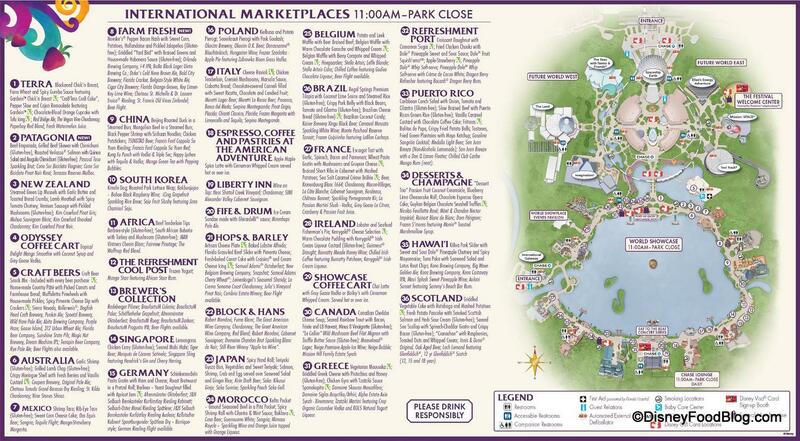 Thankfully my dad’s 26 years of military service gets him access to the Disney military resort, Shades of Green. We set off, made a few wrong turns on our way from the airport, but finally arrived at the resort in time for a little R ‘n’ R. My folks relaxed in their room while I forced my sister to explore the grounds with me. I knew I would want to get a few runs in while there, so I had to scope it out. 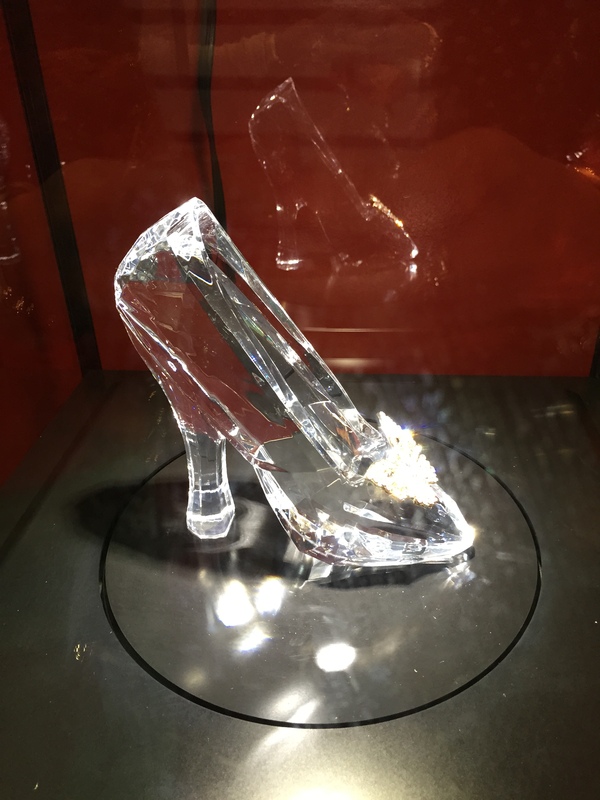 Afterwards, we gathered back up and made our way to Downtown Disney for dinner at the Wolfgang Puck Grand Café, shopping, and an impromptu viewing of the new “Cinderella” movie. If you haven’t seen it, it’s truly phenomenal! While I want that shoe, how in the world do you walk in it? Mi hermana and I were SO EXCITED! The next day, my dad and I went for a run around the Polynesian Resort, which was conveniently located across the street from our resort. The trails and sidewalks weren’t all connected due to some major renovations, but it was otherwise a fun and easy run with my dad. Afterwards, we got a delicious buffet breakfast and headed out to Universal Studios for, what else, The Wizarding World of Harry Potter! So, lesson learned, apparently they have broken up the Wizarding World (Hogsmeade and Hogwarts) from Diagon Alley, which means you need a park hopper ticket to enter both. We weren’t aware of this difference, and only realized it when I was trying to find my sorority sister (from Maryland) who also happened to be there the same day. In order to go back and forth, you take the Hogwarts Express, but only with this ticket. Hogsmeade was so cute, I could have moved in. it came out of the movie – snow covered, slighly leaning buidlings, wonky little shops, and the castle rising above it all. Universal Studios does make me appreciate Disney World so much more, however, for the organization and attention to detail. Although the park was fun, it was easily crowded and not very well laid out. Once we made our way to Islands of Adventure, we headed through the world of Dr. Seuss (Seuss Landing) and the Lost Continent, until we passed through the gates of Hogsmeade! First on the agenda? 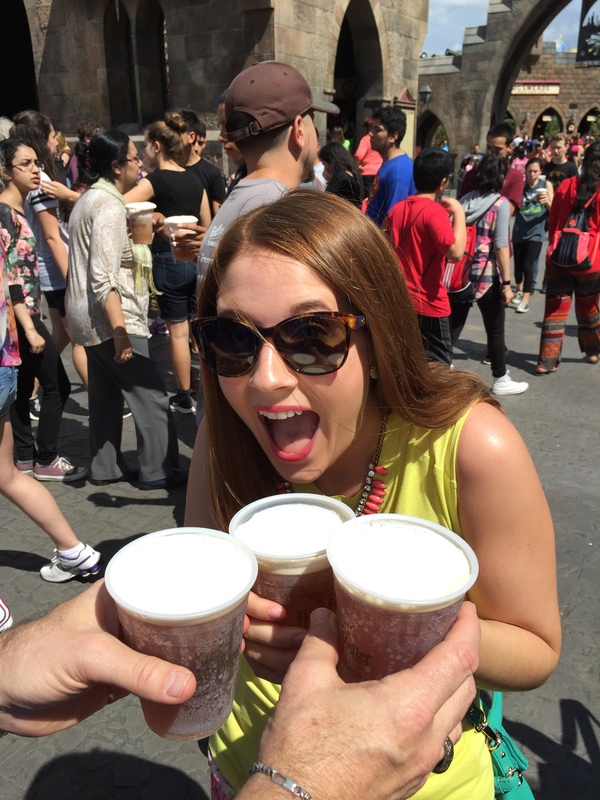 Butterbeer, obviously! And it did not disappoint. This caramel, butterscotch concoction was so delicious, refreshing and sweet… I could have had several but limited myself to one. How can you stop with just one?? It’s the entrance to Dumbledore’s office! Afterwards, we decided to check out the Hogwarts castle ride, Harry Potter and the Forbidden Journey. The line was about 45 minutes, although it didn’t take that long. 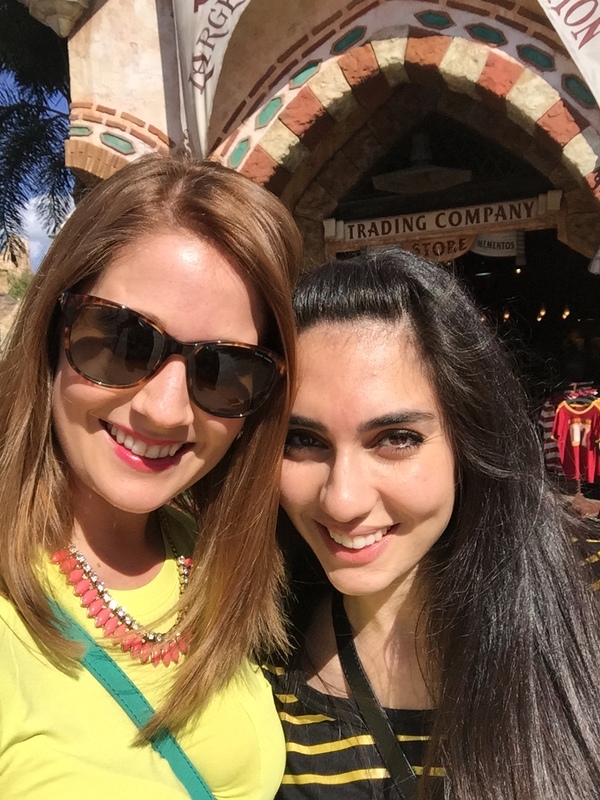 Once we got a locker for our purses (which was kind of a hassle), we meandered through the greenhouses, past potted Mandrakes, and into the castle, complete with interactive paintings, disappearing stairwells, and the Defense Against the Dark Arts classroom. 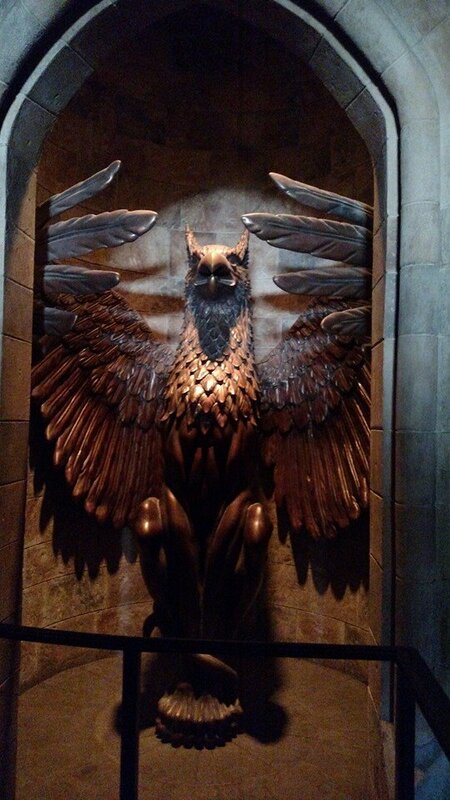 When you arrive in Dumbledore’s office, he is there to greet you with his Pensieve and Fawkes the phoenix. The castle was very well designed, and made the waiting all the more worthwhile. Harry, Ron and Hermione are waiting for you in the Defense Against the Dark Arts classroom and attempt to explain that you will be enchanted so you can fly on a broomstick like witches and wizards. The ultimate goal was a little unclear, but then you make your way into the final passage, past the Singing Lady, and onto the ride. The ride itself is INCREDIBLE. I don’t say this lightly. It’s a meaningful length and completely transformative. The seats are the kind that strap you in over your head, allowing your feet to dangle. There are 4 people in a row, and then you are off on your flying adventure. The ride takes you through all of the scary, creepy, adventuresome moments in the books/movie. You find yourself amidst a Quidditch game, launched into the forbidden forest surrounded by Aragog and his eight legged friends, being chased by Dementors and dragons, and so much more. 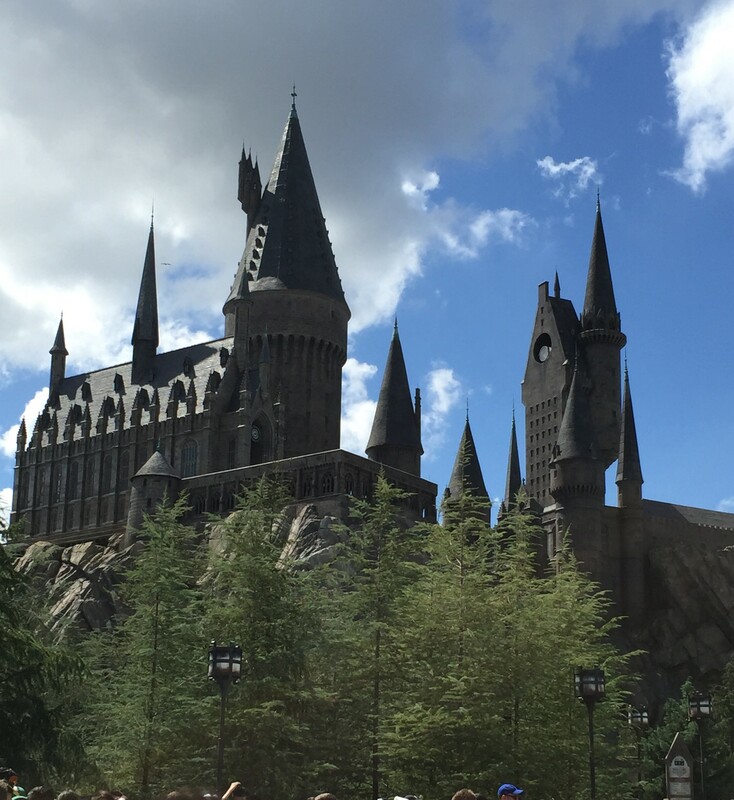 You truly feel transported into this magical world – I literally screeched a few times in surprise! The castle, and the ride, are so on point! 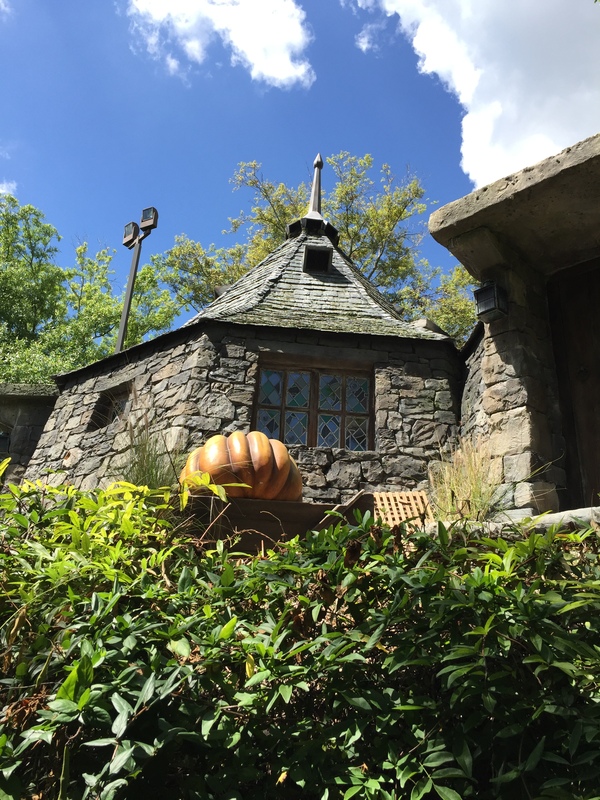 Hagrid’s hut was on point! a gander at the wands available in Hogsmeade. Finally we decided to hop on the Flight of the Hippogriff ride, which was easy and fun. The life-size Buckbeak was really cool, nestled in his nest, occasionally peaking up to see what was going on. All-in-all, it was so much fun. 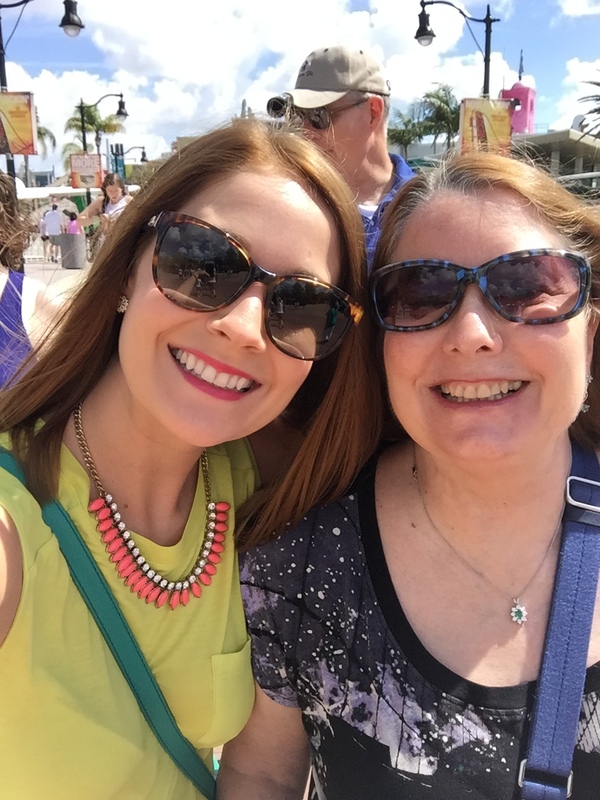 It was a pretty toasty day, so we decided not to wait for the Dueling Dragons ride, and instead, in honor of my mama’s birthday, took her to Margaritaville for a few margs in the air conditioning. 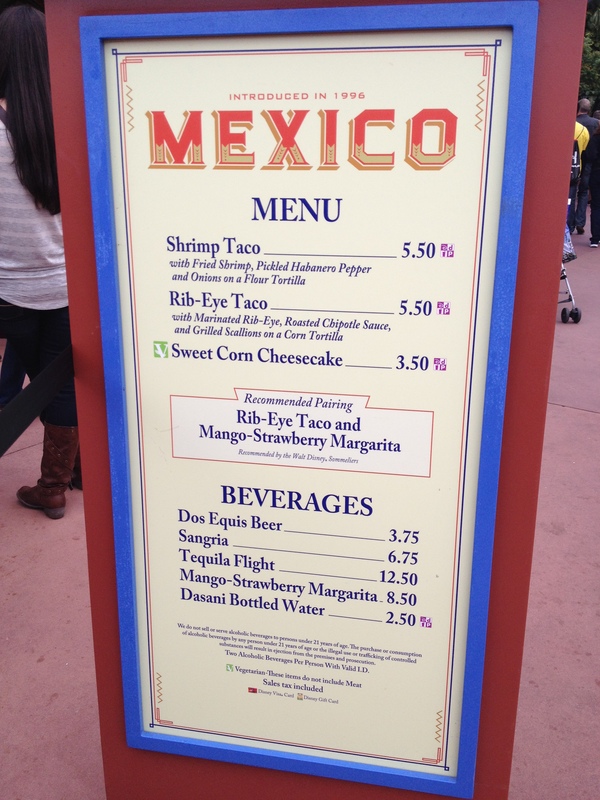 I am admittedly not a huge Jimmy Buffet fan, but the margaritas at this place are awesome. They don’t skimp, and they’re delicious. 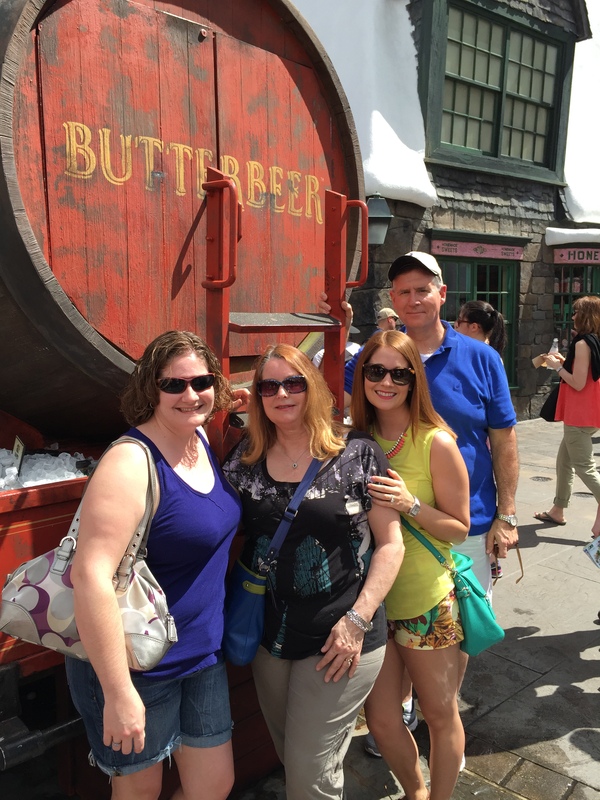 Ironically, one of my sorority sisters and darling dear friends was also on a family vacay and happened to be at Universal that day! 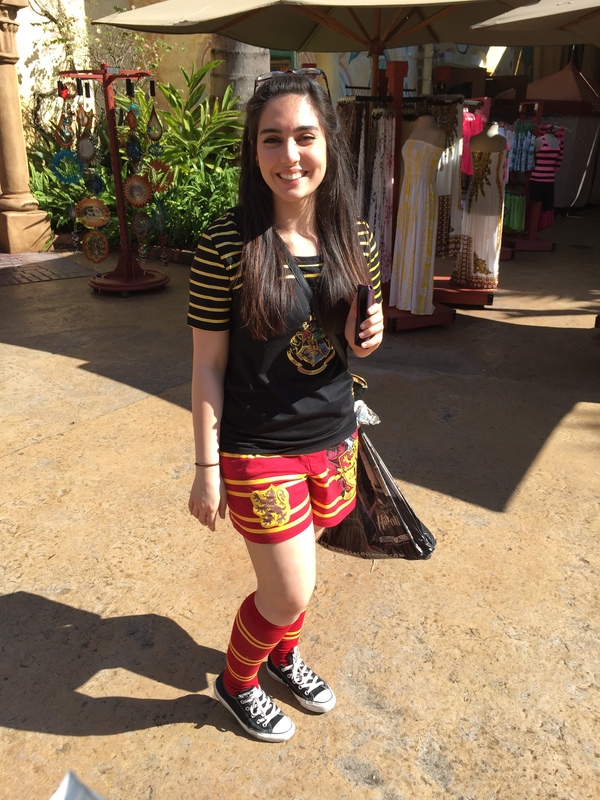 They had spent much of the earlier part of the day in Diagon Alley so I couldn’t get over to see them, but after sipping our margaritas, she had popped over to the Islands of Adventure side of the park. I went back in the park long enough to give her a big hug, snap a few photos (she was adorably adorned in HP gear), and quickly catch up. Afterwards, we headed back to the resort to meet up with my brother and his wife, who had just arrived, and get a yummy birthday dinner for my mama. Love you, Juliet! 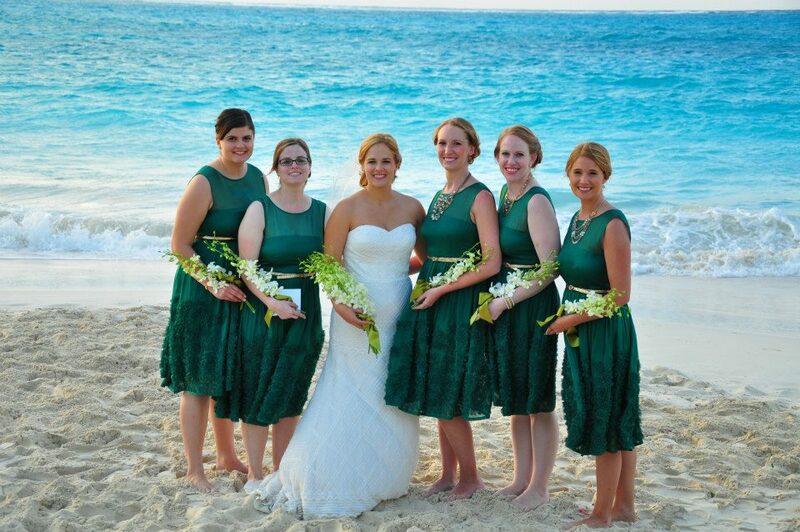 So glad we found each other! Um, how cute is she? Be honest, how much am I missing from Diagon Alley? 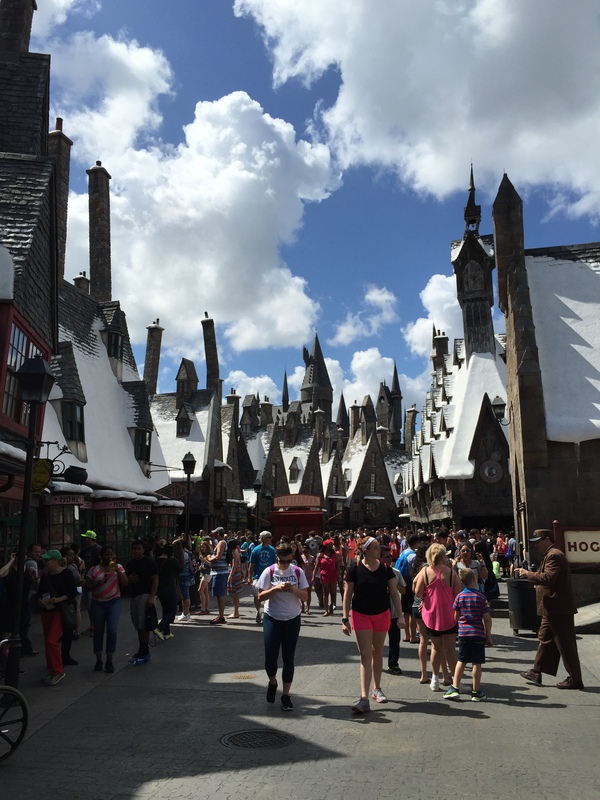 Anyone else just love Harry Potter World? It’s okay to still act like I am 8 years old as an adult, right? 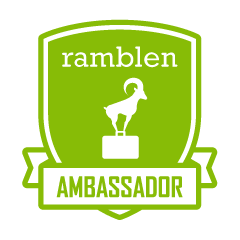 Thanks for bearing with me, fellow blogging world! Over the past three months I have made the transition into a new position at work, and it’s been quite a bit all-consuming. I am still trying to figure out how to balance my work, personal, and social media lives, so I appreciate your patience as I have been so absent! I know it isn’t yet the New Year but it’s never too early to make goals (see my thoughts on resolutions). One of my goals is to make time to write – it makes me happy, I love to share fun experiences, and I appreciate the feedback I get from fellow bloggers and readers. 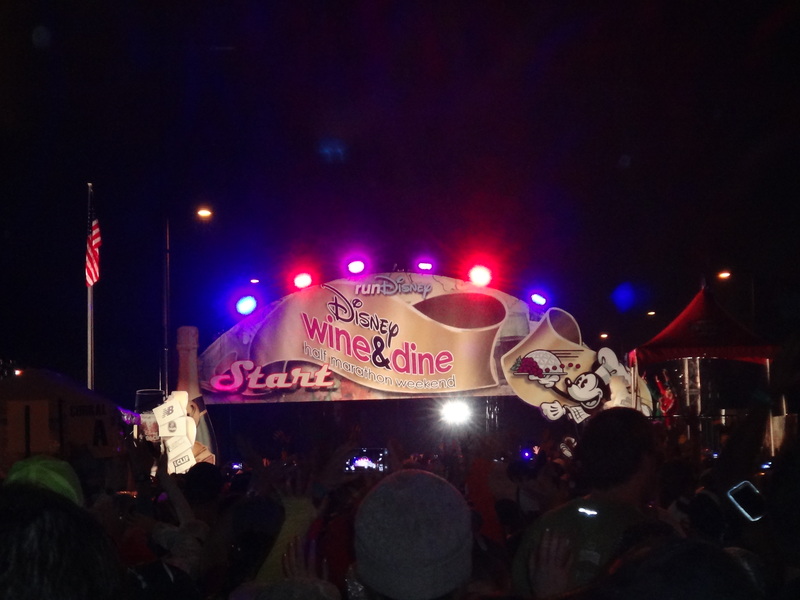 So on that note, I would like to (finally) present to you the race recap from the Disney Wine and Dine Half Marathon! When Samantha and I initially began plotting what we wanted to do for the Wine and Dine, of course we naturally started with the costumes. We went to many iterations, first trying to plan a group costume, and then deciding it might be easier to do couples’ costumes. 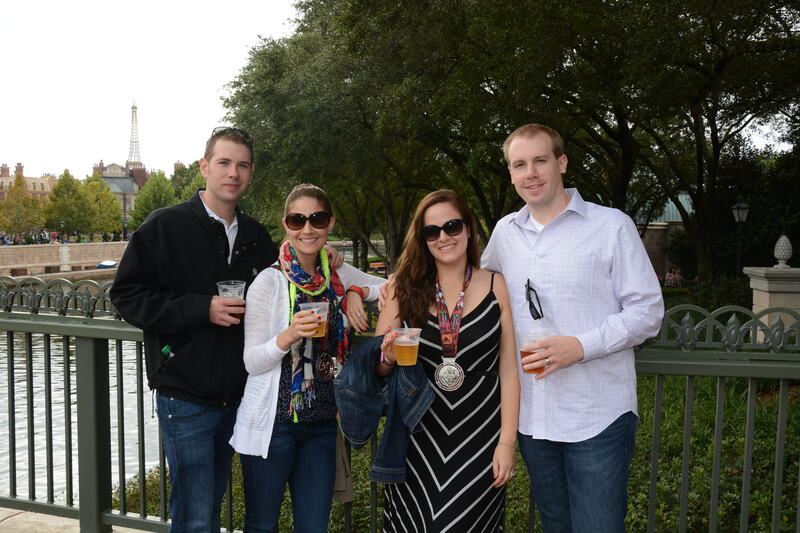 Finally we ended up with Mickey and Minnie Mouse (aka Mr. and Mrs. BakeNBurn) and the hubs and I ran as Mr. 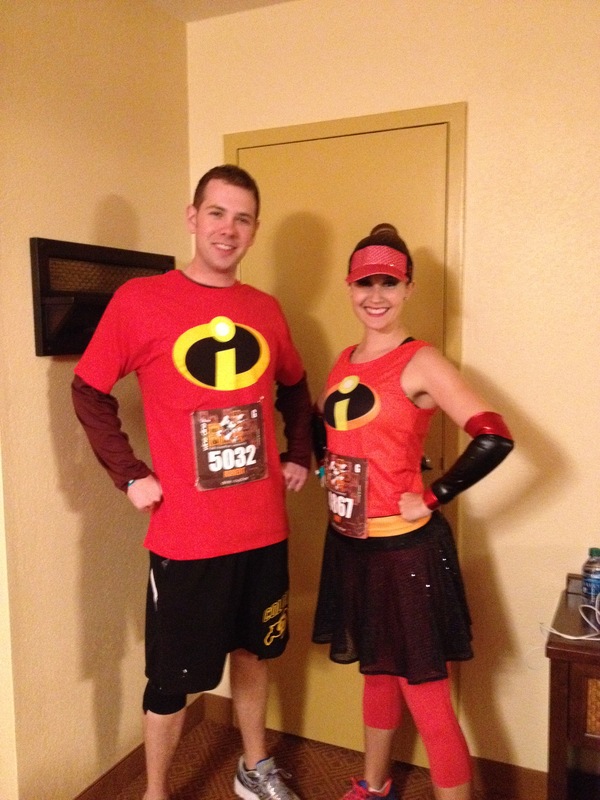 Incredible and Elastigirl! The hubs and I are huge fans of the Incredibles, so it was a perfect fit. 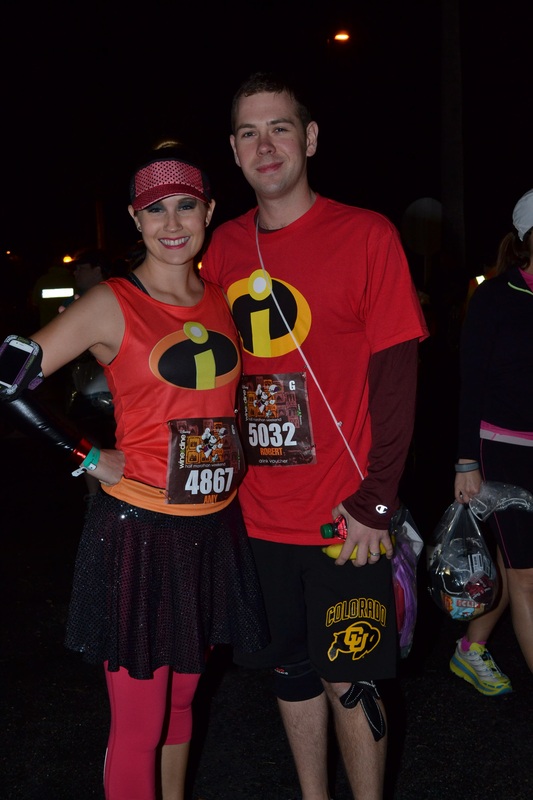 And knowing my hubby isn’t thrilled by running costumes, it made the outfit very easy (although we did see some Incredibles couples with the men wearing red tights… that’s dedication!). The hubs and I as Mr. and Mrs. Incredible, and Samantha and her hubby as Mickey and Minnie! The day of the race was pretty relaxed. 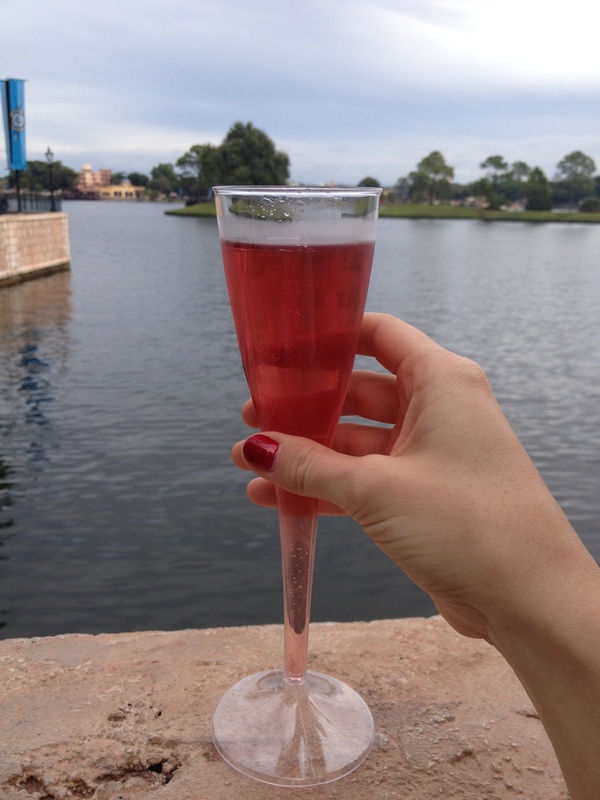 We’d stayed out in the Magic Kingdom until the end of Mickey’s Once Upon a Christmastime parade, so we woke leisurely, grabbed some grub at the cafeteria and lounged by the pool. The day was overcast, which was rather foreboding for the weather forecast that night. It was predicted to rain starting around 10pm, just when the first wave of the race was set to start. We figured at this point there was little we could do, but Samantha had the brilliant idea to look for ponchos at the resort gift shop. Remember those $10 giftcards from the packet pickup? Oh yeah, they came in handy, along with the visors we purchased the day before! We each bought a poncho, ate a quick dinner, and went back to the room to change. Oh yeah, we did a lot of posing. Pre-race photo ops, of course! Having already done one Disney race, I knew it would not be beneficial to risk catching the last bus from the resort to the staging area. We decided the second bus, which would pick us up just after 6pm. Given our resort’s proximity to the ESPN Wide World of Sports complex, which is where the race began, it was a quick ride. We arrived just after 6:30pm and decided, what the hey, let’s get some pictures. 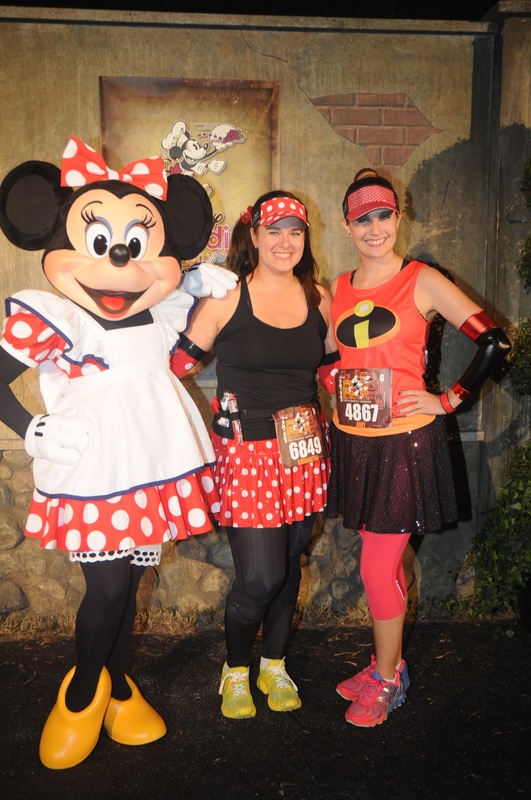 We found pre-race photographers, used the porta-potties, and stood in line for a Minnie Mouse photo-op (it was perfect for Mrs. BakeNBurn, although I think Minnie really preferred Mr. BakeNBurn!). 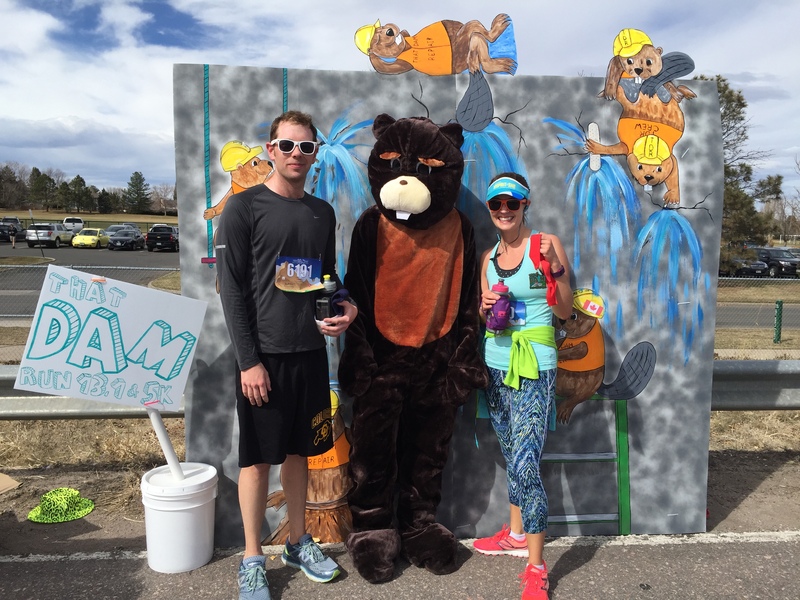 We sat down for a little while, but I decided one additional restroom break was in order, and by the time I returned, it was time to get ready for the race! We make ponchos look good. and I would let the boys do their own thing once we started. We didn’t realize at the time that Samantha was actually fighting a knee injury, but boy was she a CHAMP. We waited about 20-25 minutes before our corral actually set off, and by this time it was just plain raining. Given we didn’t really have a choice, we decided to make the most of it and just have fun. 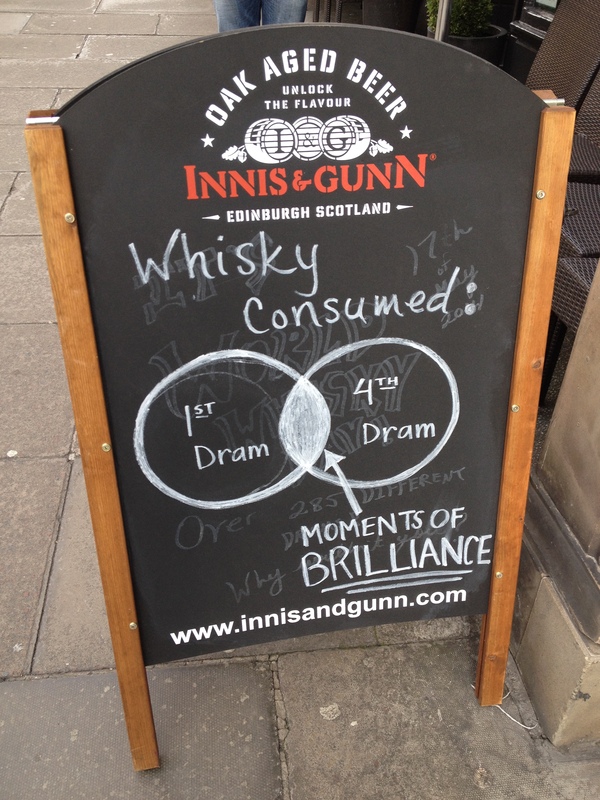 And that is precisely what we did! Once our wave was ready to set off, the boys went ahead to run to their hearts’ content. Samantha and I frolicked along looking for fun photo ops. 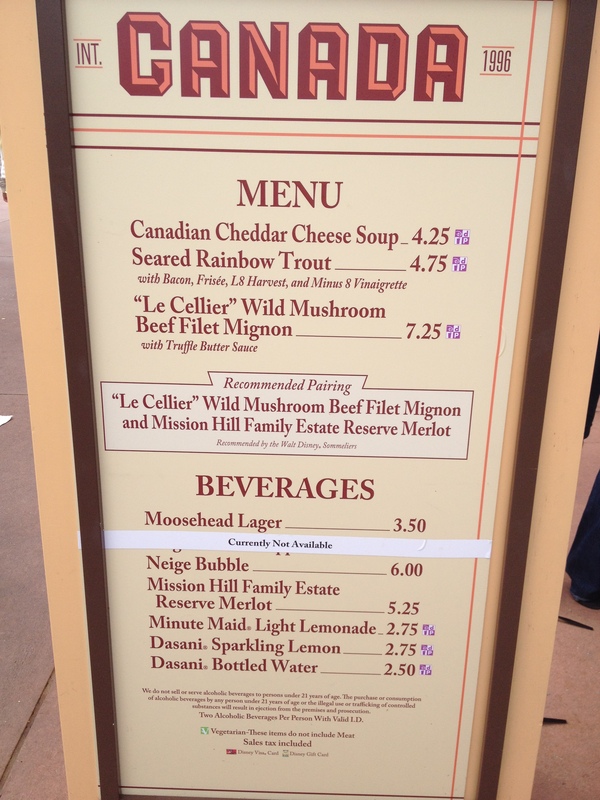 There were many to be had, although a number of the characters weren’t available due to the rain. The first photo op was with some random fairies, but knowing many other photo stations wouldn’t be operating, we jumped in! At this point Samantha had ditched her poncho, somewhere around the 1st mile marker, but I decided to keep mine on for a while. I hate being wet, and thankfully it was vented along the side so I could still feel cool. Also, I get cold really easily, so I knew I didn’t want to be shivering through the next 12 miles. Instead, I would turn my poncho into a cape (which I know is terribly wrong, considering Edna Mole’s comment on capes: “NO CAPES!”). I mean, hey, when life gives you ponchos, you make capes! 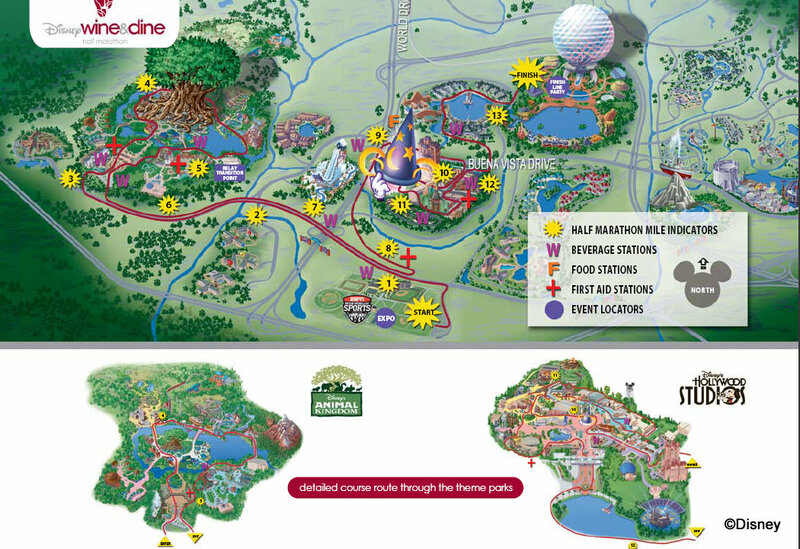 The race course went through 3 parks, which really helped the miles fly! and loved running through it. With the rain it really felt like a jungle! Before entering the park we passed by a mini light parade and Rafiki! There were photographers scattered throughout, and running in DinoLand was pretty spectacular. This portion of the race took up about 2 miles, so once we exited we were on our way to the 10K mark. 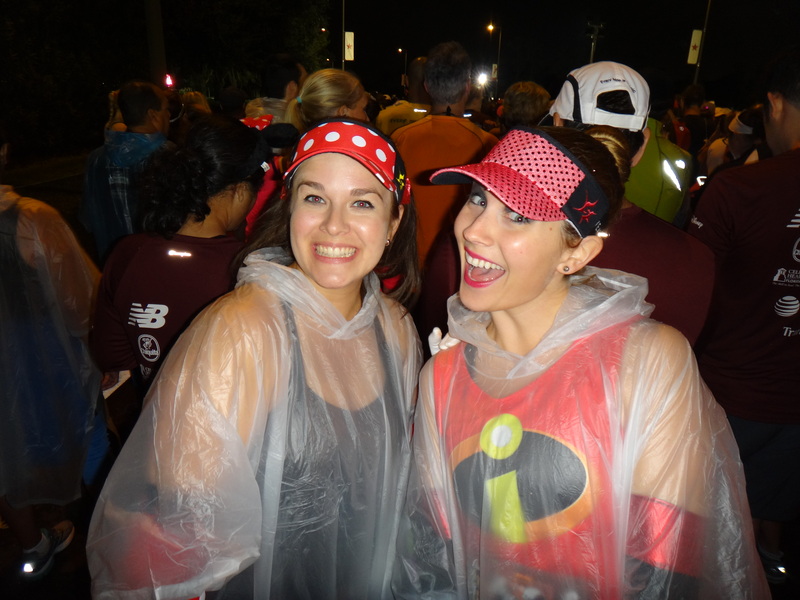 Miles 6 through 8 were all on roads in between the parks, and because of the rain, course entertainment was not to be found. Thankfully we were finally making our way into Hollywood Studios! This was by far my favorite park of the race. We entered through a back lot into the middle of Hollywood Studios and quickly made our way past Mickey’s wizard hat. It was pretty spectacular all lit up at night. We meandered through Hollywood streets and then towards the back of the park where we ran through a psychedelic tunnel with windows into costume design studios. We got to see the costumes and mock-ups for the princesses, which in my mind, was spectacular. Look, a turtle! Go Terps! We were obviously THRILLED to see Rafiki! 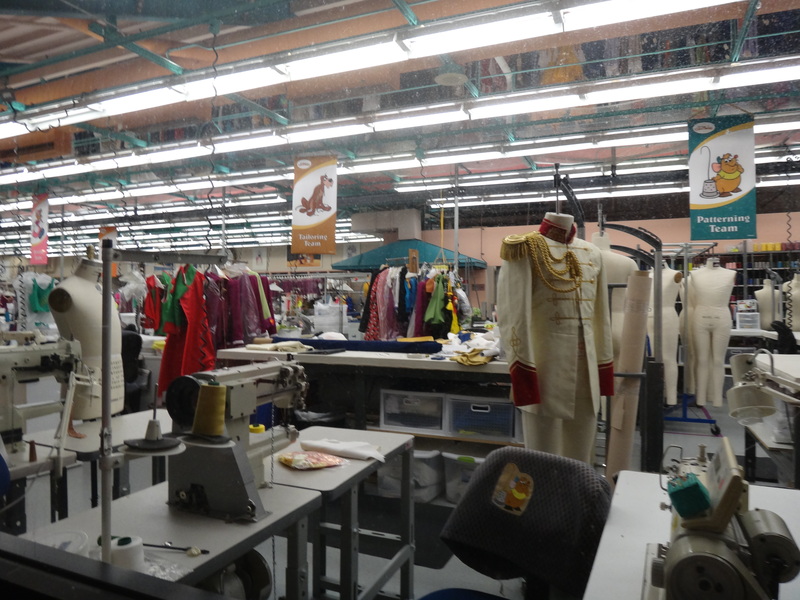 The costume design rooms were spectacular! Look, Prince Charming!! I was wondering two things around this time: 1) when were we going to see the Incredibles, and 2) when were we going to run through the Osborn Family lights? Thankfully my questions were soon answered. 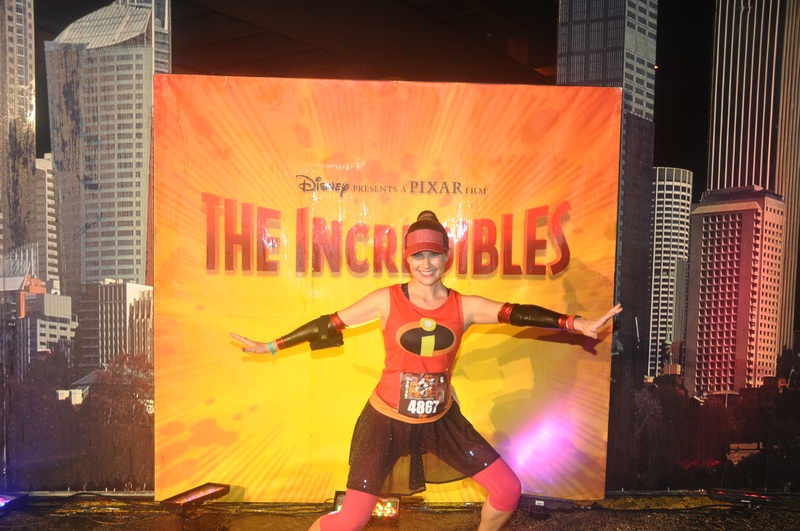 Alas, the Incredibles characters were not available when I ran past, but I took the opportunity to pose enthusiastically in front of the Incredibles backdrop. I was in character, after all. 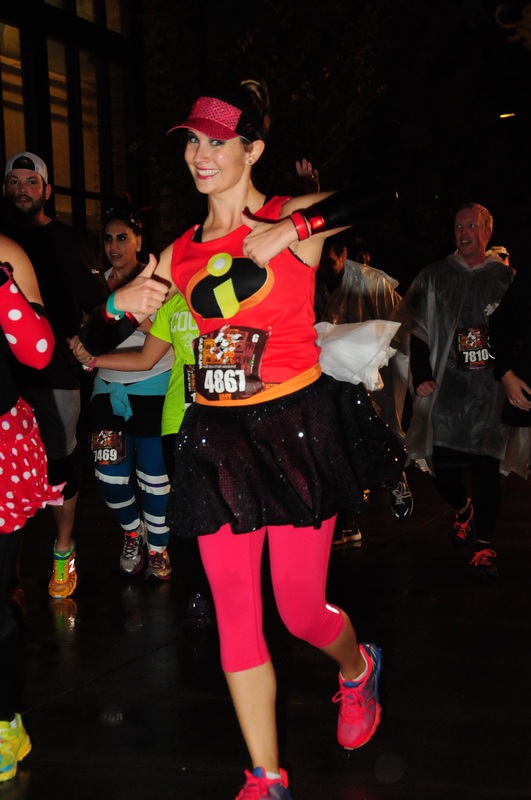 I was positively joyous when the photographer shouted, “Elastigirl, you made it!” It was nice to see the photographers cheery, because they, also, had to be stuck in the rain. 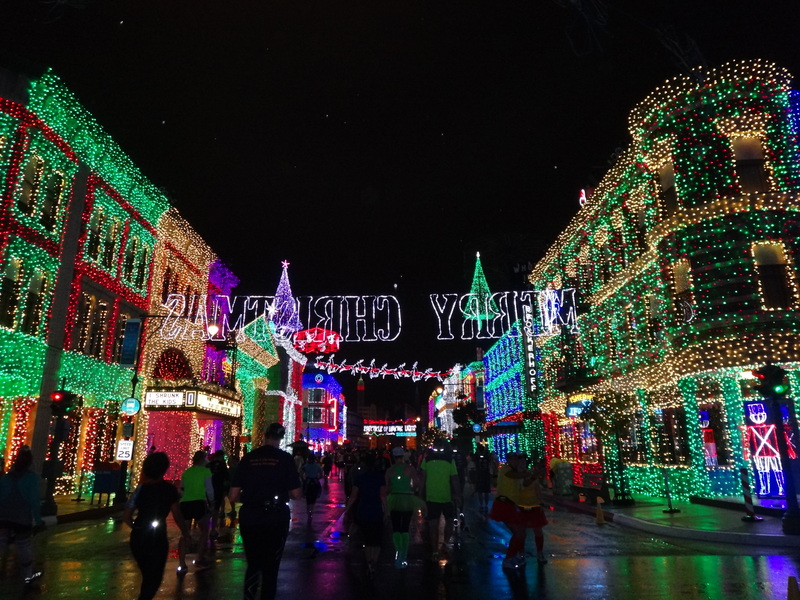 Shortly after passing my photo op, we looped back around in the backstage area of Hollywood Studios and quite literally emerged in the splendor of the Osborn Family Spectacle of Dancing Lights! This was my moment to shine! Behold the splendor of the Osborn Family Lights! Quite literally everything has a light on it. 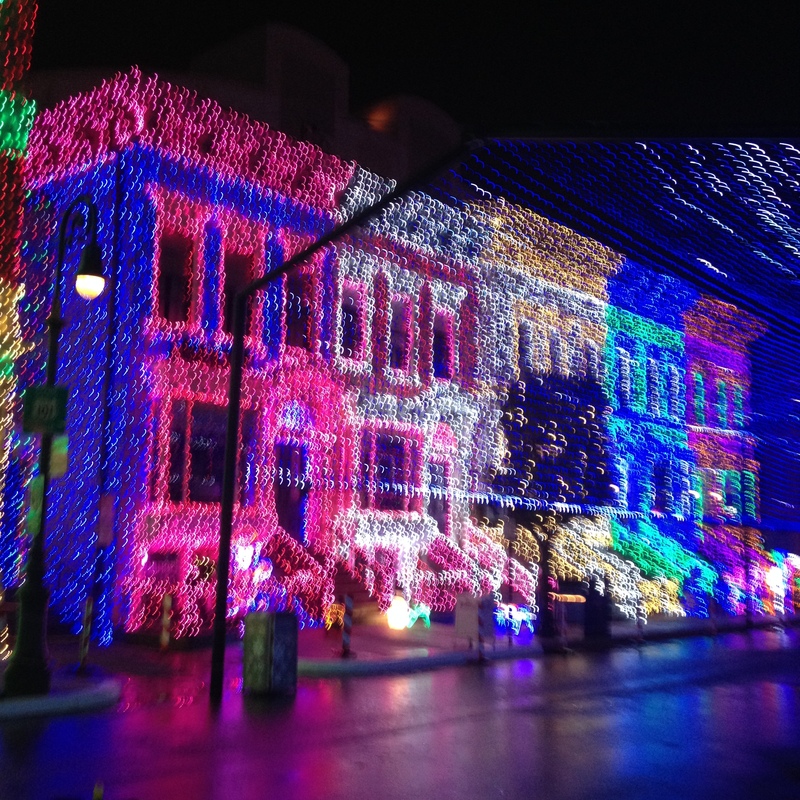 If you’ve never seen this spectacle, it’s completely worth the visit. I have never seen as many glorious lights in my life. 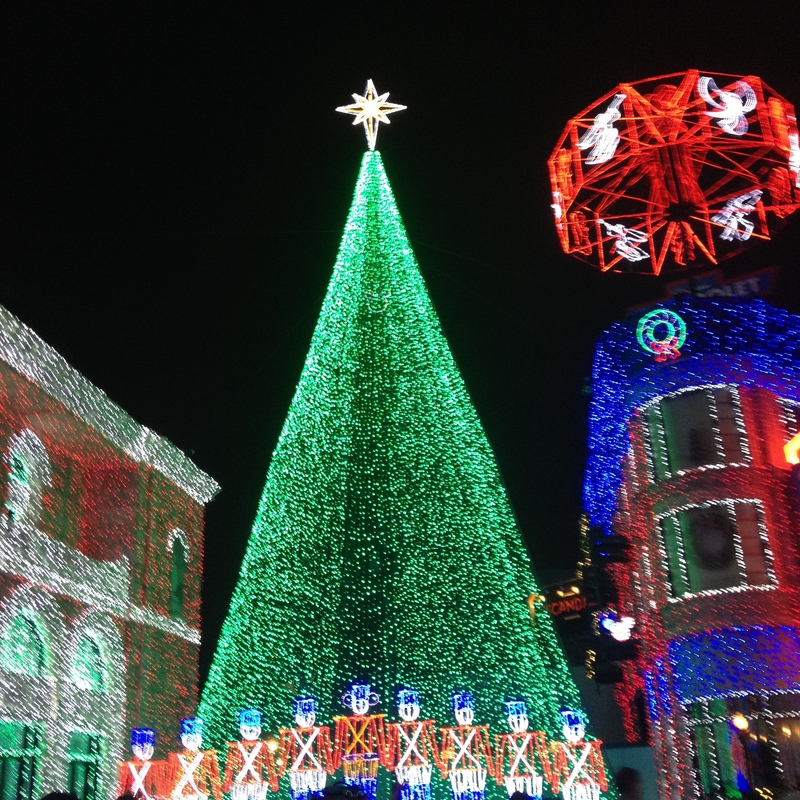 Disney took the idea from the Osborn family in Arkansas who initially started doing light shows coordinated to Christmas music. It’s really phenomenal and had last seen the show in December of 2010. It in every way encompasses the magic of the Christmas season! During the section we didn’t even bother running because we wanted to take it all in and have chances for photos. It’s just too beautiful to run right through! 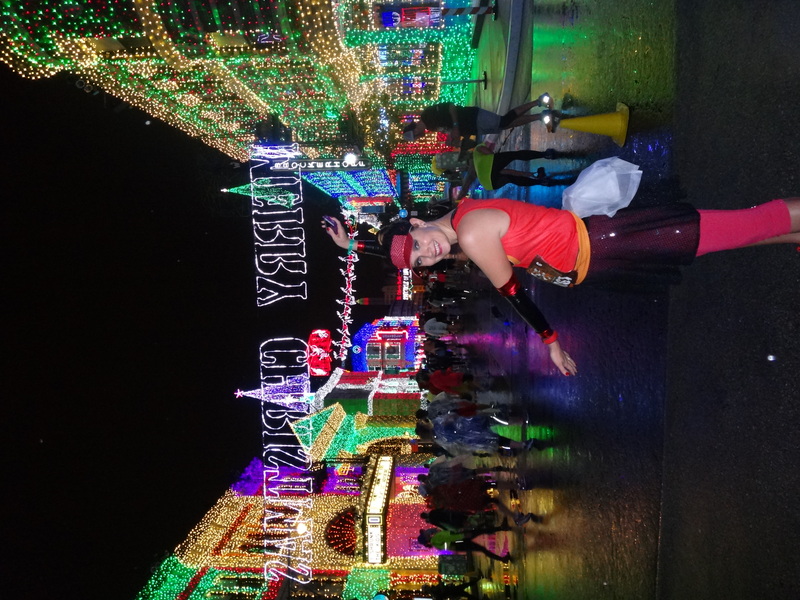 This is my pose I stole from my friend Christine from the Princess half. 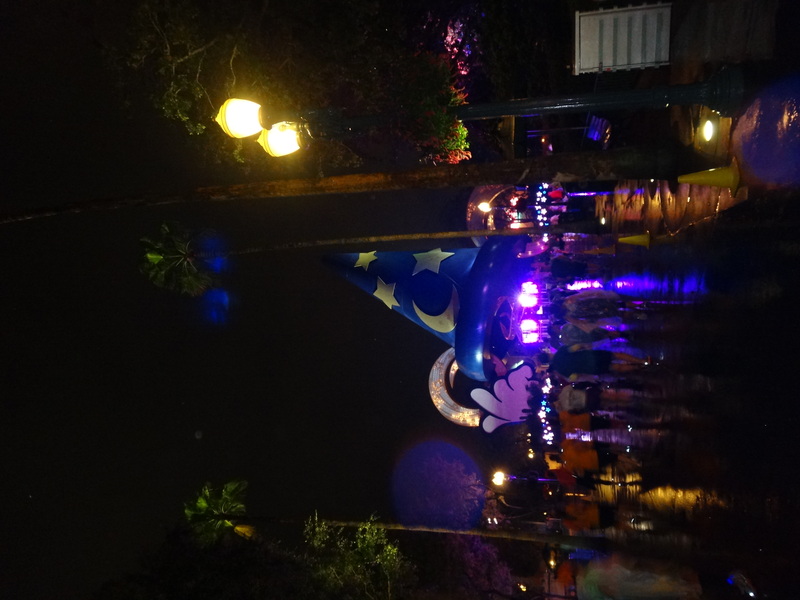 Once we finally peeled ourselves away from the shimmering scene, we wound our way back through the park and passed once more by Mickey’s wizard hat. It turns out this hat will be bidding a fond farewell to Disney World so I am happy I could see it one last time! Once we exited the park, we were on our way to mile 11, with just the Boardwalk to go! As we made our way from Hollywood Studios to the Boardwalk, we ran under a bridge. The space underneath was PACKED with ChEAR squad participants, excited and encouraging in the wee hours of the morning! 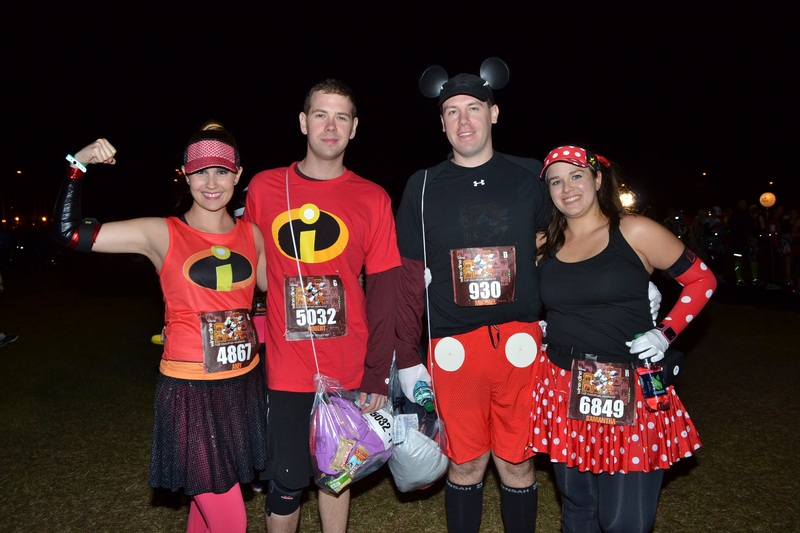 These folks are truly phenomenal – they show up to the Disney races, which are either at 5:30 in the morning or 10:00 at night, and never fail to put a smile on a runner’s face. It was the little boost we both needed to get through the last few miles. Passing by all the Boardwalk resorts was also a lot of fun, although the boardwalk itself was rather treacherous while wet. 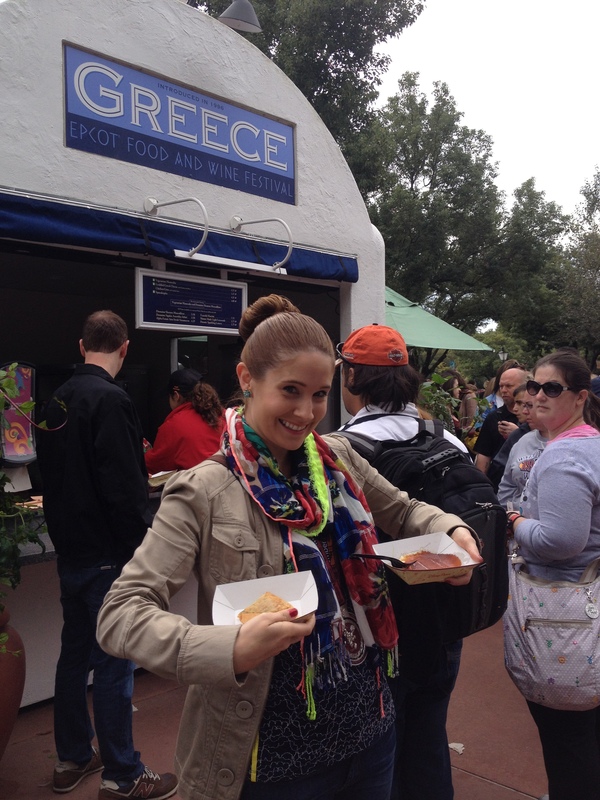 We trod carefully and worked our way up and into Epcot! 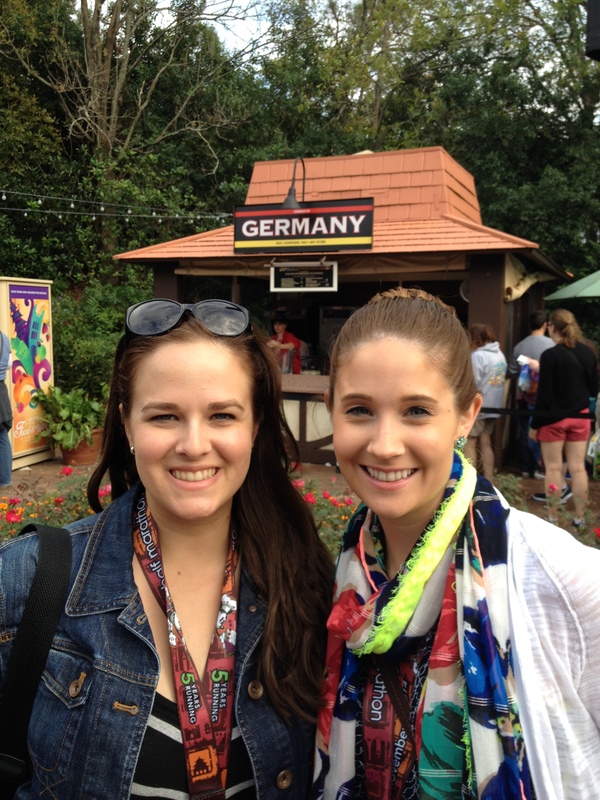 We entered in the back of the park through the entrance to the Showcase of Nations. The after party was taking place, but I think we had already decided that hanging around later into the early morning hours in the rain didn’t sound overly enjoyable. 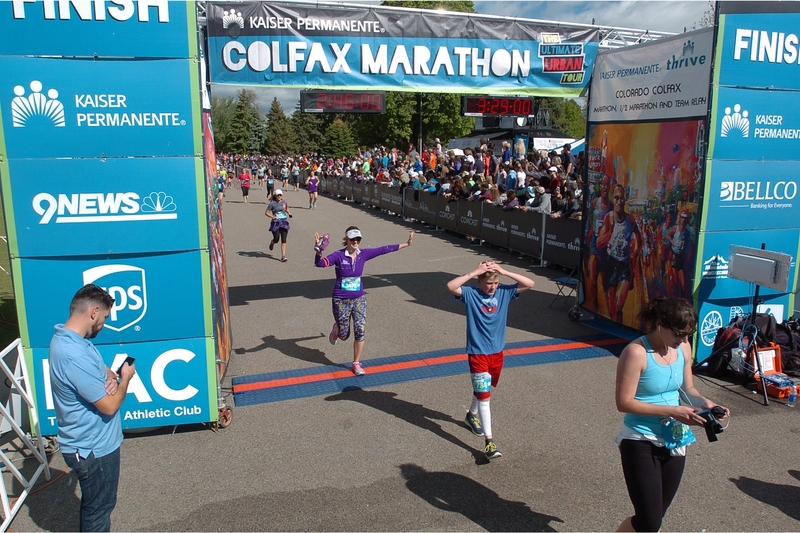 We weaved through the park and ran out of the entrance toward the finish line in the parking lot. We made it, and boy did we work for it. Samantha and I both held up pretty well given the conditions and the miles. Our costumes remained intact and we were so thankful to be done. 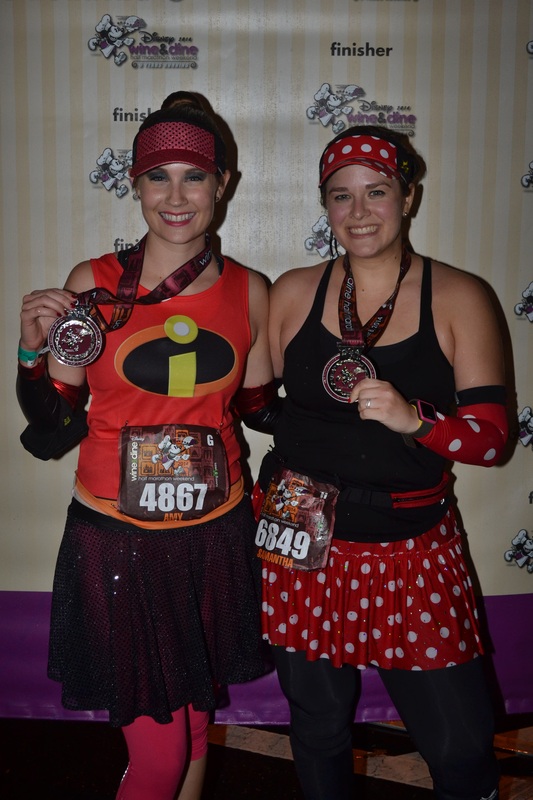 We grabbed our mylar blankets, post-race snack packs, and of course, our gorgeous medals. These babies were well worth the effort. 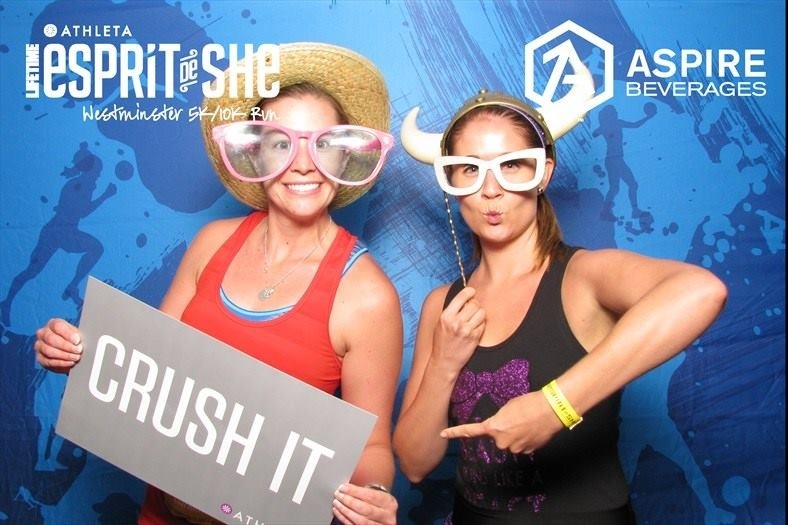 We found an open finisher’s photographer station then made our way out of the throng of runners to find our hubbies. Rather than go to the party they were waiting for us after the finisher photos. We were all pretty ready for hot showers and bed, so we worked our way to the bus stations, and thankfully made it on the available bus for Caribbean Beach. 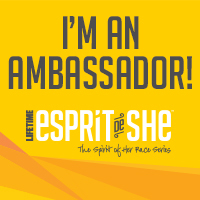 All in all, it was a great race, and one I would definitely do again. Sadly you cannot control the weather, and I would love to be able to experience it in better conditions, with all the characters out in action. 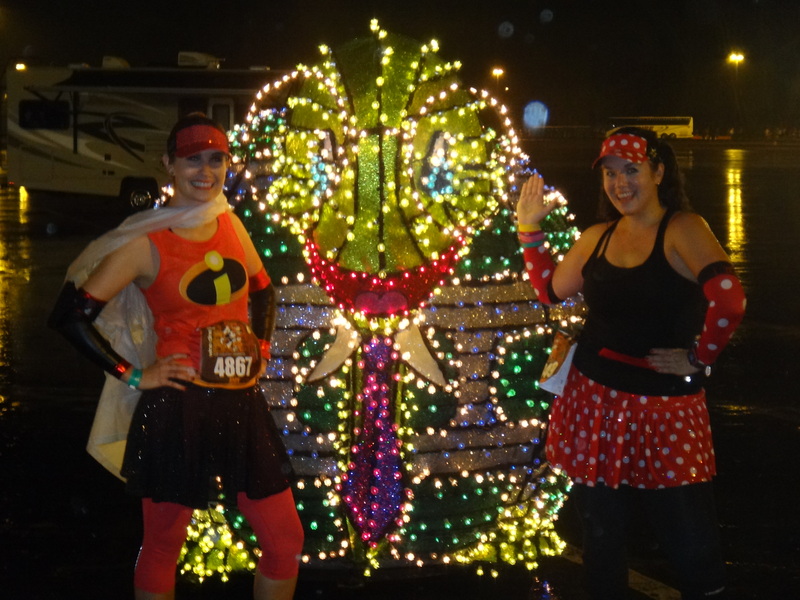 I was so thrilled to be able to run a second Disney race in 2014, and with another of my dearest friends. 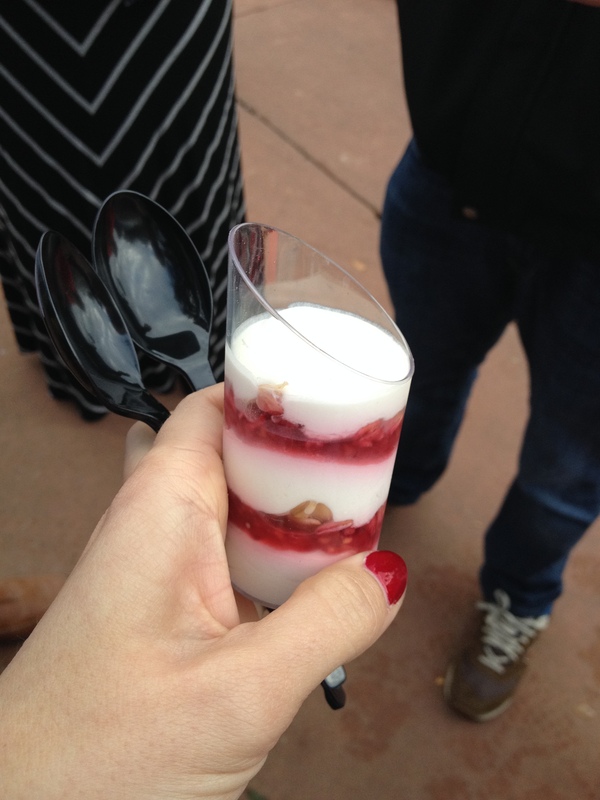 The whole weekend was topped off by the Disney Food and Wine Festival in Epcot, so although we didn’t indulge in the after party, we still managed to get our fill! 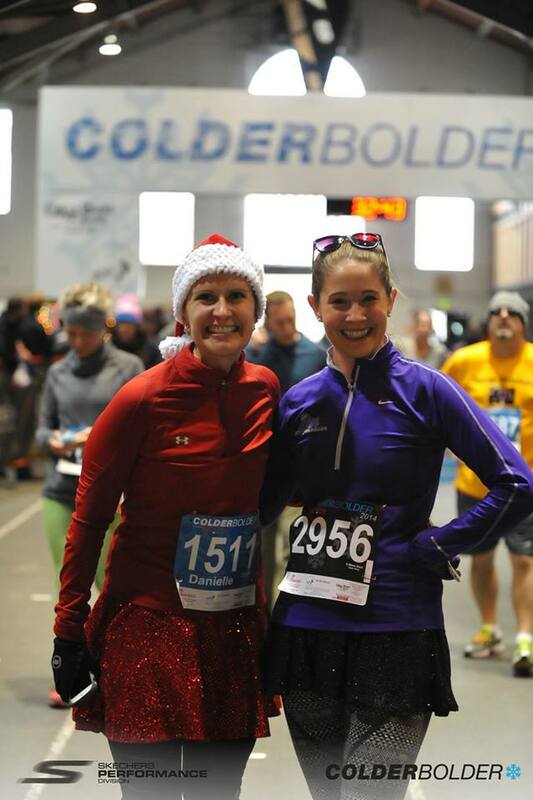 Here’s to an amazing running year, and having completed now my 5th ever half marathon – all in 2014! Have you ever run a half, or longer, in the rain – any other recommendations? 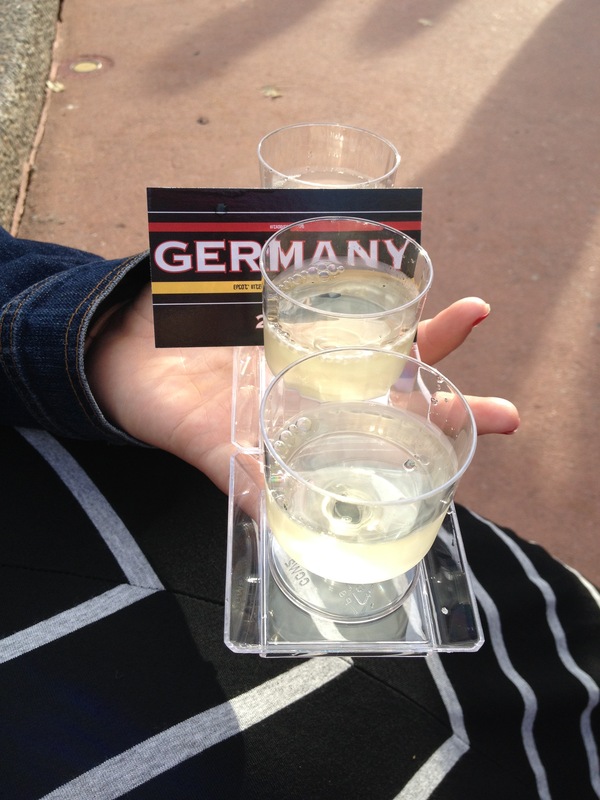 Would you run for wine (and food)? 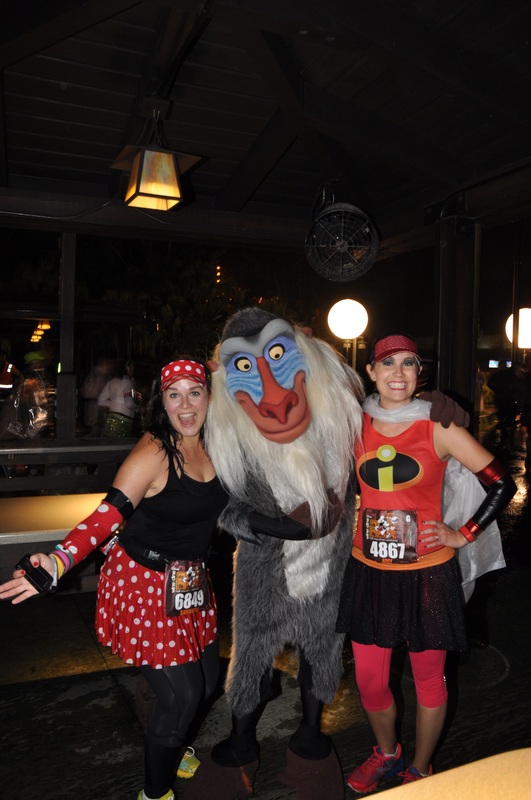 Which Run Disney race is your favorite? Who doesn’t love frolicking through sparkly Christmas lights?